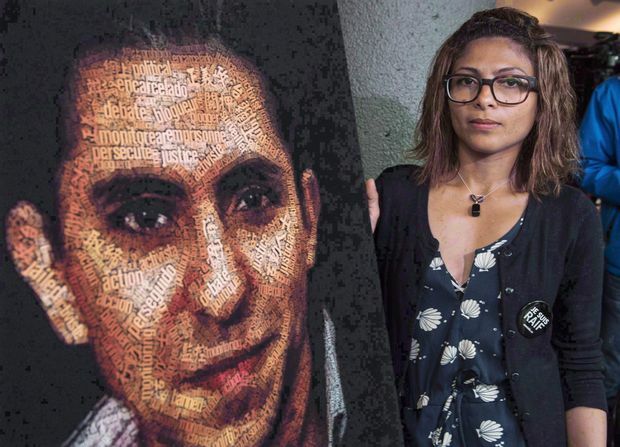 Amnesty International says the global community should form a united front with Canada and speak out to protect two recently arrested women, including the sister of jailed blogger Raif Badawi. Genevieve Paul, the director of Amnesty’s francophone branch, points out that pressure is put on the Saudi government when news of such arrests becomes public. “I don’t think it will worsen the situation because very often when we make evident unjust imprisonments, like the case of Samar Badawi, that increases their protection and increases pressure on the government,” she said in an interview Monday. Amnesty International has said Badawi’s sister was recently detained along with Nassima al-Sada, another prominent female activist. Paul pointed to the case of Raif Badawi as an example of how putting international pressure on the Saudis can have an impact. “He was sentenced to 1,000 lashes and 10 years in prison, he received 50 lashes in 2015 and he could receive others, but he hasn’t,” she said. Ensaf Haidar stands next to a poster of a book of articles written by her husband, the imprisoned Saudi blogger Raif Badawi. (File Photo). Paul stressed the situation is worse when the government does what it wants in secret and is not singled out for alleged human rights violations. “Clearly the aggressive reaction of the Saudi government shows that it’s been disturbed,” she added. Saudi Arabia said Sunday it was ordering Canada’s ambassador to leave the country and freezing all new trade and investment transactions with Canada in a spat over human rights. The Islamic Kingdom made the decision in retaliation to a Global Affairs Canada’s tweet that expressed concerned about the arrests of civil society and women’s rights activists in the country, such as Samar Badawi. Paul said the Saudi government knows there are serious human rights violations in the country. “It shows the real colours of the regime, and the international community should toughen its tone against the Saudi government,” she said. The Amnesty spokeswoman noted a ban on women drivers was lifted in June, but that a number of activists who campaigned for the right to drive were arrested and face up to 20 years in prison. She reiterated that Ottawa should suspend the sale of armoured vehicles to the Saudis, claiming that Amnesty still has strong reasons to believe they are being used in Yemen to commit serious human rights violations. “We’ve been saying that without a serious human rights evaluation, we should not be transferring any military aid, any arms to Saudi Arabia,” Paul said. Foreign Affairs Minister Chrystia Freeland said Monday the Canadian government will continue to raise its voice and defend human rights. “We will always speak up for human rights, we will always speak up for women’s rights around the world,” she told reporters in Vancouver. Ensaf Haidar, Raif Badawi’s wife, who lives in Quebec with her three children, said Monday she was surprised when she heard about the two new arrests.